Nice long shirt 100% organic merino. This woolen kids shirt is wearable throughout the year as a heat regulating shirt. The merino fibers work both cooling and warming. In the winter months it is an ideal thermal underlay. So soft and warm! 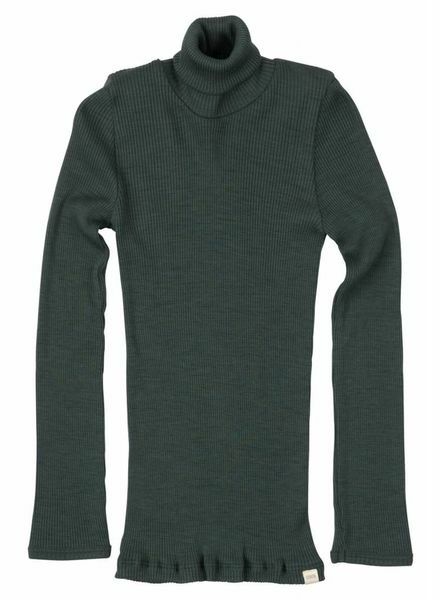 Turtleneck in soft mulesing-free merino wool. Double-stitch rib for a unisex look. Tight fit but highly flexible. So soft and warm! Seamless longsleeve shirt in soft mulesing-free merino wool. Double-stitch rib for a unisex look. Tight fit but highly flexible. Great year round basic! This 100% organic merino tanktop is a great baselayer for both in summer and in winter. It covers the shoulders and nek properly for higher comfort. Wool cardigan in a thin and soft jersey knit. 100% merino wool with wooden buttons. Can be worn on the skin or as an extra layer upon the MiniPop wool body or the Minimalisma silk shirts. Oeko-tex + mulesing-free. So soft and warm! Tanktop in soft mulesing-free merino wool. Double-stitch rib for a unisex look. Tight fit but highly flexible.